Father William Sirr (1862-1937) was an Anglican priest whose cherished hope of founding a contemplative community did not manifest in his lifetime. Yet this apparent failure has served as an inspiration to many, and his example continues to guide and enlighten today. Fr. William discerned a vocation to the priesthood early in his life, but his family's straitened financial circumstances meant that he had to work for several years before starting theological training. He was employed for eight years as a confidential clerk at a wine merchant's in London, a role which sounds like it was pulled from a Grahame Greene novel and which gave him a Greene-like insight into fallen human nature. This education in the elasticity of business ethics served him well as a priest and made him virtually unshockable. Once ordained, he accepted a curacy in Vauxhall before entering the Fransiscan Society of the Divine Compassion in 1902. He was made novice master a year later and elected superior in 1906. Fr. William spent the next decade ministering to the poor in the East End. He did this with distinction and devotion but gradually came to feel that the Church was failing to connect, at the deepest level, with the people who most needed her. This, he believed, went back to the dissolution of the monasteries under Henry VIII and the subsequent absence in the Church of England of the enclosed, contemplative life. He held that for the Church to impact positively on society, her practical ministry needed to spring from the hallowed and ancient soil of stillness, prayer and contemplation. Increasingly, he felt that God was calling him to renew that tradition and provide the Church with the bedrock of silence and recollection she would need if her societal mission was to flourish. In 1918, Fr. 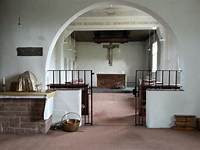 William was given permission to found a monastery in Glasshampton, Worcestershire, in the stable block of a derelict country house. He converted the premises admirably - no easy task for a man in his late fifties and early sixties - but was unable to find men willing to stay and build the religious community he felt called to establish. Many came to visit and spend time discerning their vocation, but the life was austere, Fr. William's culinary skills poor, and his recitation of the Daily Office so slow that it irritated rather than inspired. Temperamentally, he was perhaps more suited to the solitude of a hermitage than communal living, and he died in 1937 having failed to make his vision a reality. Yet on a deeper level, he was anything but a failure. Two of the men who came to him at Glasshampton, Fr. Robert Gofton-Salmond and Fr. Gilbert Shaw, were instrumental in the establishment of the Community of the Servants of the Will of God, based at Crawley Down in West Sussex and still flourishing today. Here is an icon of Fr. Gofton-Salmond (right), Fr. Shaw (centre) and Fr. William (left). 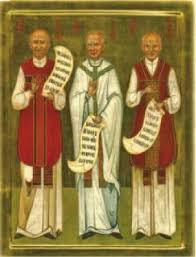 These three are regarded as the founders of the community and their memory is celebrated each year on August 18th. The monastery built by Fr. William became a house of the Society of St. Francis in 1947, so his many years in Glasshampton of prayer, waiting and patient building were not in vain in the end. Glasshampton Monastery, according to its website, was named by The Sunday Telegraph in 2011 as one of the eight best places in Europe for a retreat, so the foundations laid by Fr. William were obviously robust, both spiritually and materially. Here is a picture of the monastery chapel as it is today. Alongside this physical legacy, there is also Geoffrey Curtis's biography, William of Glasshampton: Friar - Monk - Solitary (1977), and two more recent essays I have drawn on for this post: Peta Dunstan's, Fr. William's Baton, which can be found in Oneness: The Dynamics of Anglican Monasticism edited by Stephen Platten (2017), and this 2014 article on the excellent Desert Sprituality in the City blog. Reading and reflecting on this literature, there are two things in particular which strike me about Fr, William. The first is his realisation that action needs to be grounded in the life of the spirit and not the other way around. This insight is all the more impressive as it was arrived at while experiencing at first hand the material deprivations of the London poor. Despite the grievous hardships he saw, he understood that the assistance offered by the Church would have no value unless it was grounded in prayer and contemplation. Practical help could be given just as effectively, if not more so, by a whole raft of non-Church organisations. Spirituality, after all, is the Church's raison d'être. Everything else flows from that. Fr. William would have concurred with his contemporaries in France - the 'non-conformists of the 1930s' - and their rallying cry, 'Primacy of the Spiritual.' 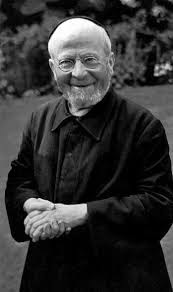 Thinkers like Emmanuel Mounier (1905-50) believed that men and women can only flourish in a society which puts their spiritual needs first and places the political and the economic realms at the service of the spiritual. This was exactly Fr. William's understanding, a worldview which he lived out at Glasshampton with great faith and single-mindedness for nigh on two decades. This is the second thing which stands out - his ability to first of all discern his contemplative vocation, and then stick with it and continue to believe in it despite a lack of tangible success. One can imagine the inner voices which must have assailed him from time to time - accusations of folly, egotism, and a dereliction of duty in the face of so much deprivation, which he had been in a position, in the East End, to alleviate. Happily, it was the 'still, small voice' which he chose to listen to, and today - 81 years after his death - we can recognise very clearly the deep wisdom that spoke to his heart and prompted him to go to Glasshampton. It sounds counter-intuitive to suggest, but Fr. William might have had more immediate success in building his community had he lived in our day rather than the inter-war era. Christianity was much more prominent in Britain at that time, with church attendance generally high. Despite poverty, strikes, and high unemployment, there was, on the whole, a far greater degree of national and social cohesion than now. But this very cohesiveness might actually have worked against Fr. William's project rather than for it. People, in those days, felt like they belonged. Whether it was the family, the neighbourhood, the church, the workplace, the union, or the guild - often all of these and more - Britons felt at home in a variety of settings and contexts, which all interlinked and related to each other like the circles of a Venn diagram. With the exception of those First World War veterans who were either unable or unwilling to adapt to civilian life, men had so many support networks and places they could call home that everything Fr. William was offering they could probably find elsewhere. His offer was so extreme and so intense that most likely it would only have appealed to those with a real hunger and desperation for God, contemplation, and fraternal, religious community. Such individuals would have searched in vain for years for these things and found only meaninglessness and rejection. Such individuals would have been few. It was not so hard, generally speaking, to find meaning and depth in the 1920s and '30s, but the situation today is very different. The institutions that brought us comfort and belonging are in varying stages of disarray and dissolution. We feel, as a result, increasingly lost and disorientated, groping blindly for contact with something real and true, but searching all too often in all the wrong places and ending up more alienated and confused than before. It hasn't quite kicked in yet, but despite (or because) of all the above, I feel we might be standing at the dawn of a new religious epoch, an epoch analogous to that which flourished across Western Europe in the fifth and sixth centuries. At that time, holy men and women like Saint Kevin of Glendalough turned their backs on the crumbling Roman Empire and the collapse of everything stable and known, and retired to remote and rocky places to live lives of prayer and solitude. To their surprise, others follow them there, seeking refuge from the chaos and finding a joy and a sustenance that were fast disappearing from the dominant culture. 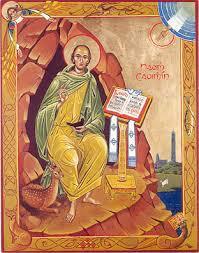 St. Kevin (below) and others like him lived lives of depth, simplicity, integrity, and sacramental devotion. They spoke to the hearts and minds of others because they themselves were imbued and aflame with the heart and mind of God. So the pilgrims stayed and new communities were born - fellowships of radiant love, which would go on to shape and transform culture and society - locally, nationally, and internationally. Hermits abound in European literature and mythology. Nasciens, the Hermit of Carbonek, is an excellent Albion-related example. Thomas Malory, in his Morte D'Arthur, tells us that Nasciens, as a young man, committed some unspecified sin against Joseph of Arimathea when the latter brought the Holy Grail and the Christian faith to these lands. His punishment was to live far beyond the span of mortal men as Priest of the Grail until the advent of Galahad, the Grail Knight, some four hundred years later. It is the Hermit of the Southern March, however - another profoundly archetypal figure - who reminds me most of William of Glasshampton. 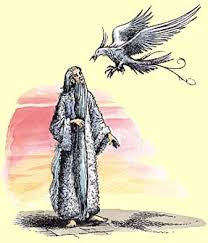 Chapter Ten of Lewis's, The Horse and His Boy, is named after this character, and he appears nowhere else in the story nor in any of the other Narnia books. 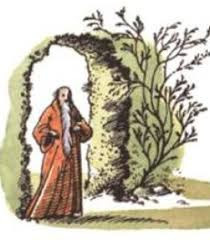 By the end of the chapter we have learned that the Hermit (Lewis uses a capital 'H') has 'lived a hundred and nine winters in this world', and has extensive knowledge of present events but limited insight into the future. He keeps goats, is a skilled medic, and has 'the hugest and most beautiful tree that Shasta had ever seen' at one end of a pool in a 'wide and perfectly circular enclosure protected by a high wall of green turf.' We are told nothing about his spiritual life, yet the chapter glows with a quiet, restful luminosity, which leaves the reader feeling as refreshed from his or her encounter with the Hermit as do the four protagonists. Shasta looked forward again and saw something which he did not take in or even think about. Their way was barred by a smooth green wall about ten feet high. In the middle of the gateway stood a tall man dressed, down to his bare feet, in a robe coloured like autumn leaves, leaning on a straight staff. His beard fell down to his knees. This little speech, in many ways, conveys the essence of Fr. William's theology. As a spiritual director, he was not so much interested in what one believed or which denomination one belonged to. He focused instead on clearing away the barriers that were blocking the life-giving, restorative action of the Holy Spirit in a person's life. Then the real work could begin - a patient, peaceful waiting on God in silence of heart and quietness of mind. 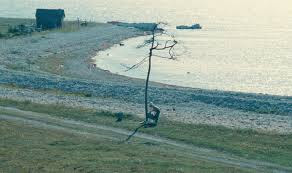 Like the mute boy in Andrei Tarkovsky's film, The Sacrifice, who sets about watering his dead father's tree in faith and hope that one day it will miraculously bloom. Or like Shasta in the very next chapter of The Horse and His Boy, who hears the Voice of Aslan while riding wearily to Anvard, following the Hermit's instruction to warn King Lune of the coming Calormene attack. As with Bree, Shasta is lifted out of self-pity and narrow, self-defeating horizons and shown a wider, truer perspective. It is a miracle. It is what we all long for, and it will happen to us just as it happened to him, be that during our lives, at the end of our lives, or at the end of time itself. 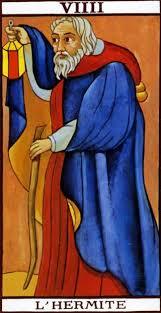 It is the 'one thing needful' - heart to heart contact with the Living God - and it is what Fr. William spent so long, and so successfully in the end, trying to restore to the life of the Church. He knew how much his country needed it. And if we needed it then, how much more so now? The High King above all kings stooped towards him. Its mane, and some strange and solemn perfume that hung about the mane, was all round him. It touched his forehead with its tongue. He lifted his face and their eyes met. Then instantly the pale brightness of the mist and the fiery brightness of the Lion rolled themselves together in a swirling glory and gathered themselves up and disappeared. He was alone with the horse on a grassy hillside under a blue sky. And there were birds singing. 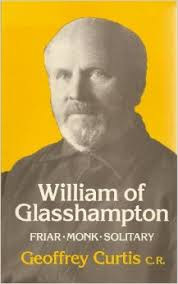 William of Glasshampton, pray for us. I completely agree with you, John, that action needs to be grounded in the life of the spirit to be right action. Otherwise we just flail around often doing more harm than good. The hermitages of the past might have acted like little beacons of light in the community keeping the fire of faith burning so that others could lead their everyday lives in its glow. We badly need something like that now.